In the depths of Winter bites can be hard to come by with the fish's metabolism low meaning they dont need a lot of feeding. In this one I fish a standard cage feeder with a sponge soaked in a liquid attractant which can stimualte this fishes taste buds into them looking for food. Click HERE to down load. Meat is a well know bait to tempt big Carp, but dont be afraid to experiment with different colours and flavours. This one I look at dyeing the meat black. Click HERE to open the link. Click on the image here for the link to an instructional video that I did for the Go Fishing Website. It was done on the fantastic Llangorse Lake in the Brecon Beacons and specifically looks at fishing the sllider in deep waters for Roach, Bream and Hybrids. In this feature I look at breadpunch fishing on a pellet dominated water for Skimmers and Roach. 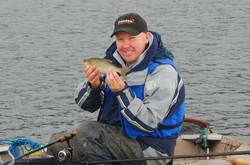 Thanks to Pat McInnes and Pole Fishing Magazine for permission.